When we left, my only disappointment was that I had not been able to take a picture of the immense art work Marta created in the early 1960s when she began her one-woman performance. Because she was unknown at the time, she wanted to pretend the auditorium was full, and so she began painting in an audience on the surrounding walls and on the ceiling. To create the work on the walls required four years; the work on the ceiling, two. To dramatize the setting, I thought that if I could only get into the auditorium when it was empty (See, the auditorium often fills to capacity now!) I might duplicate the times, which was, of course, an auditorium filled primarily with the art work she had created. I took many photographs, all from a tripod and all were long time exposure, ranging from 3 to 12 seconds. I used a super-wide angle 12mm lens–and I bracketed my exposures. Over the years, Marta’s work as an artist has been recognized internationally. Currently she spends winters giving her live stage performances and summers creating works of art. Recent clients include the movie actor Martin Sheen. Certainly, Ms. Becket is a talented woman, and I hope my images in this visually reduced format do justice to her immense talent. This entry was posted on Sunday, April 20th, 2008 at 9:15 am and is filed under Photography, RV Travel. You can follow any responses to this entry through the RSS 2.0 feed. You can leave a response, or trackback from your own site. 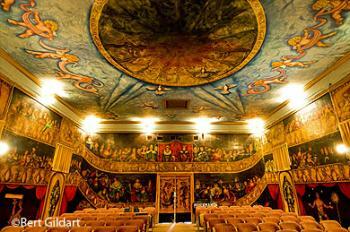 I enjoyed your post about Marta Becket–and especially your photos of the Amargosa Opera House.